Almost everyone knows that just about any path toward your physical well-being begins at the office of your primary care physician, commonly known as your PCP. However, don’t think that your mental health needs are any different. In fact, getting to the root of your mental health condition typically begins with primary care, as well, and there are many reasons for this. 1. The gap is finally being bridged between mental healthcare and primary care. While there is admittedly a long way to go, patients and providers are now both recognizing primary care as the cornerstone of all aspects of health and well-being, both physical and mental. In fact, it has been cited in a recent study that primary care physicians now provide well over half of mental healthcare treatments in the United States alone. 2. You feel comfortable with your PCP. Let’s face facts. You talk to your primary care physician about most of your healthcare needs, including migraines, a sore throat or that annoying water weight gain that you’ve been experiencing. You have built a rapport, and your PCP knows your health history, along with family predispositions and economical or environmental factors that could affect your treatment and your overall progress. If there is a health crossroads, where all roads begin, it is at the neighborhood office of your primary care physician. 3. You can be screened right at your primary care physician’s office. Before it is determined whether you need to seek help from a mental health care professional, a simple behavioral health assessment can assist your PCP in determining if you do, in fact, require treatment from a mental health professional. 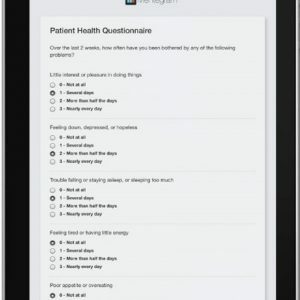 In the past, this would consist of filling out a bit of paperwork, but today, patients can answer a few questions loaded onto a kiosk in the office or on a tablet, similar to the questionnaire (PHQ-9) below offered by Mentegram. Mental health assessments now work hand-in-hand with technological advances to provide mental health assessments in a fast, efficient manner, putting you one step closer to receiving the treatment that you need. 4. You may need help with a referral. If you are in the United States and you think that you may need to see a mental healthcare professional, it is not always a requirement through your insurance coverage. However, it may simplify the process to visit your primary care physician, also referred to as a “family doctor”. Your PCP will be able to determine which type of mental health care professional will best suit your needs, if necessary. 5. Your PCP may be able to provide a course of treatment without outside assistance. Many primary care physicians may be able to accommodate many mental healthcare conditions, such as anxiety or mild depression, right within their offices. In fact, some areas may have a shortage of mental health care professionals, opening the door for PCPs to provide treatment. However, even in areas within the United States with an adequate number of psychiatrists, counsellors and therapists, primary care physicians actually write the largest number of prescriptions for antidepressants and antianxiety medications. However, if your PCP would rather your psychiatrist prescribe these medications, they will typically still provide refill assistance when needed. As primary care physicians seamlessly fill the void between discovering a mental illness and seeking treatment, and technology steps in to change the face of behavior health screenings, the stigma long associated with therapy-related settings will soon begin to fade into oblivion. As the focus shifts from hiding our concerns to exposing them, we will be on our way to receiving better, more efficient mental health outcomes. Angela Ash is a professional article writer and editor, specializing in online content and authoritative blog topics. Her additional therapy-related content may be found at https://mentegram.com/blog. Angela is also the Content Manager for Mentegram, a mental healthcare technology company that is bridging the gap between patients and their therapists. They have helped over 200 therapists provide better care to more than 1,500 of their patients, and she loves sharing experiences that could assist others to do the same.